For most women, the symptoms of perimenopause can range from acne and carb cravings to hot flashes. Find out more here. Perimenopause is the one time in a woman’s life when both PMS and menopause symptoms can occur simultaneously. Eek! Do you know what’s worse than PMS? PMS plus menopause symptoms, all at the same time. For many perimenopausal women, this is reality. And, unfortunately, it can be the reality for years. But it doesn’t have to be. More and more women entering perimenopause are actively educating themselves, questioning their healthcare providers, and searching out natural treatment options for the array of physical, mental, and emotional symptoms they’re experiencing. In this two-part article, you’ll learn about the symptoms of perimenopause, which are a unique combination of PMS and menopause symptoms, and how to manage them using natural perimenopause treatment. There are two stages of perimenopause—early and late. Early perimenopause—marked by increasing variability in menstrual cycle frequency—typically begins around age 40, although this is highly variable. Technically, a woman can be said to be in early perimenopause if her periods are more than seven days different from normal (e.g., her regular cycles are now every 24 instead of 31 days). Late perimenopause starts when a woman has two or more skipped cycles and a period of no bleeding that lasts more than 60 days. While most women believe that perimenopause begins when estrogen levels start to fall, this is not actually the case. In fact, estrogen levels can fluctuate wildly, especially in early perimenopause, sometimes reaching abnormally high temporary levels during the cycle. Estrogen levels will eventually decrease, but not until six months to one year before actual menopause. Late perimenopause, meanwhile, coincides more strongly with typical menopause symptoms (including those shared by both PMS and menopause). For instance, hot flashes and night sweats (vasomotor symptoms), depressive symptoms, and sleep difficulties are much more likely to occur in late perimenopause. 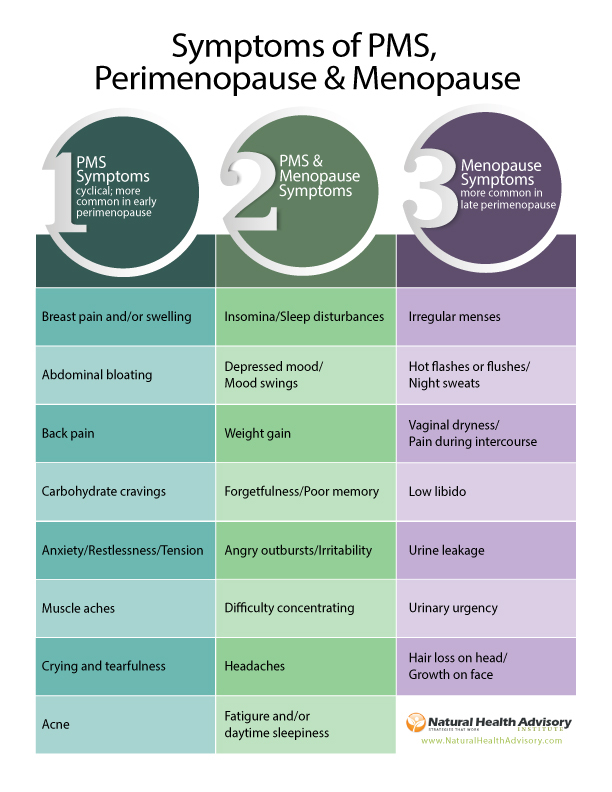 The full spectrum of perimenopause symptoms, therefore, incorporates both PMS and menopause symptoms, with some symptoms occurring in both conditions, as reflected in the table, below. Click to download chart in a new window. The symptoms of perimenopause can vary in severity and frequency. Each woman’s perimenopause experience is different. Some women report no perimenopause symptoms at all except irregular menstrual periods that eventually stop when they reach menopause. Others will have symptoms that are progressive and problematic for months or years. Perimenopause treatment with natural therapies is an excellent way to manage perimenopause symptoms no matter the stage of this transition. In part 2 of this article, you’ll learn about the most-researched and effective natural remedies for perimenopause. 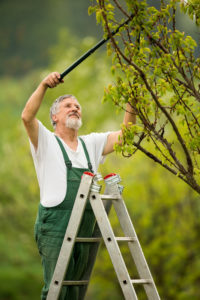 after menopause, depressive symptoms, estrogen, hormone, hot flashes, irregular menstrual periods, late perimenopause, menopause symptoms, menstrual cycle, menstrual period, natural remedies, natural remedies for, natural remedies for perimenopause, natural therapies, natural treatment, night sweats, perimenopause, perimenopause symptoms, perimenopause treatment, pms, report, sleep, stages of perimenopause, symptoms of perimenopause, the menstrual cycle.